Recorded in Italy and the Netherlands, 2005‐2015, by leading harpsichordists, specialists in the style: Pieter‐Jan Belder, Michael Borgstede, Francesco Cera, Yago Mah�go, Franz Silvestri. Newly written liner notes are included in the booklet. Brilliant Classics is proud to have released a number of harpsichord music CDs of the highest quality over the past few years. This collection brings these works together, as well as never before published recordings, allowing the listener to soak up the sounds of 17th‐ and 18th‐century France in its most intimate, domestic setting. The release starts with Jean Henri d�Anglebert, featuring four of his extensive suites. Each begins with a precisely notated prelude, followed by various dance movements of lively gigues and slow sarabandes. Anglebert�s complex ornamentation system was so admired that it would later be copied by J.S. Bach. Francesco Cera, described as �one of the most promising talents in Italy�, performs the works. Jacques Champion de Chambonni�res comes next; known as the �founding father� of the French harpsichord tradition, he worked in the courts of both Louis XIII and XIV as a dancer and musician. Franz Silvestri plays on a modern‐day harpsichord after Vaudry, Chambonni�res� suites reflect the regal French court at its peak. Pieter‐Jan Belder, whose recordings span keyboard music from across Europe during this period, chooses to put the spotlight on Le Roux, a shadowy figure about whom not much is known. He has left us with a beguiling set of harpsichord suites, unusually printed twice: once for one harpsichord and one as an alternative setting for two harpsichords. CD8 brings together music by Louis‐Nicolas Cl�rambault and Louis Marchand, two composers who straddled the divide between the early French harpsichordists and later masters of the era. Their suites oscillate between solemn, introspective passages and lively, exuberant dance movements. 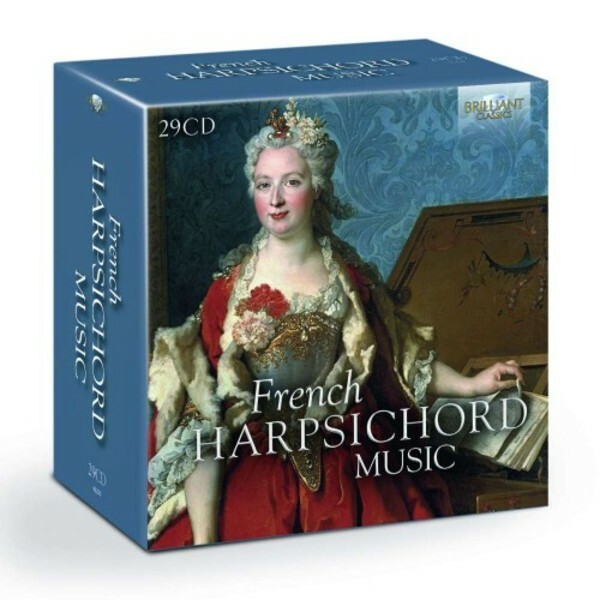 The master of the harpsichord, Fran�ois Couperin, commandeers eleven of the 29 CDs of this set � and for good reason. His 4 Livres de pi�ces de clavecin deserve to be heard in their entirety. Couperin published nothing until he was in his forties, thanks to his duties as court harpsichordist, but his collections represent twenty years of composing. The titles are often regarded as labels unrelated to the inherent properties of the piece, but Couperin said that he �always had a subject in mind when composing these pieces�, leaving the listener now to muse over the ones we know less about. What, for example, are Les Baricades mist�rieuses, or La Bandoline? Others are more obvious: La Fine Madelon, for example, can be traced back to Jeanne Beauval, a prominent actress at the time. Although the Ordres do not begin with a prelude, included here is the respective prelude from L�Art de toucher le clavecin that shares their key. Michael Borgstede performs the works, accompanied when necessary by Haru Kitamika on the harpsichord, Sophie Gent on the violin and Joshua Cheatham on the viola da gamba. Borgstede also plays the works of Antoine and Jean‐Baptiste Forqueray, father and son, who had a stormy relationship, with Antoine even arranging for his son to be imprisoned and banished in 1725. They were later reconciled, and Jean‐Baptiste published a mixture of works by his father and his own compositions, some directly transcribed from the viol to the harpsichord, and therefore remaining low in the harpsichord�s range. CDs 22�24 feature Rameau, with the first of these made up of pieces �en concert�: delightful harpsichord trios with a violin and viola da gamba. His solo harpsichord compositions contain remarkable depictions of emotions and natural phenomena � Le Rappel des Oiseaux, Les Tourbillons for example � and some of the most technically demanding writing for harpsichord in the Baroque repertoire, performed with aplomb by Pieter‐Jan Belder. Yago Mah�go features again, this time playing music by the French‐Italian composer Royer. Described as a �fine disc� by Arkiv Music on its first issue, Mah�go negotiates Royer�s works with ease, finely negotiating the variations between simple and grand passages. The set concludes with music by Jacques Duphly, whose works are still in the tradition of Chambonni�res more than a century and a half before. They do include some new innovations, such as the Alberti bass, looking forward to the Classical period. Duphly�s death in 1789 marked a new era in Europe, as well as the end of the blooming harpsichord tradition of France.